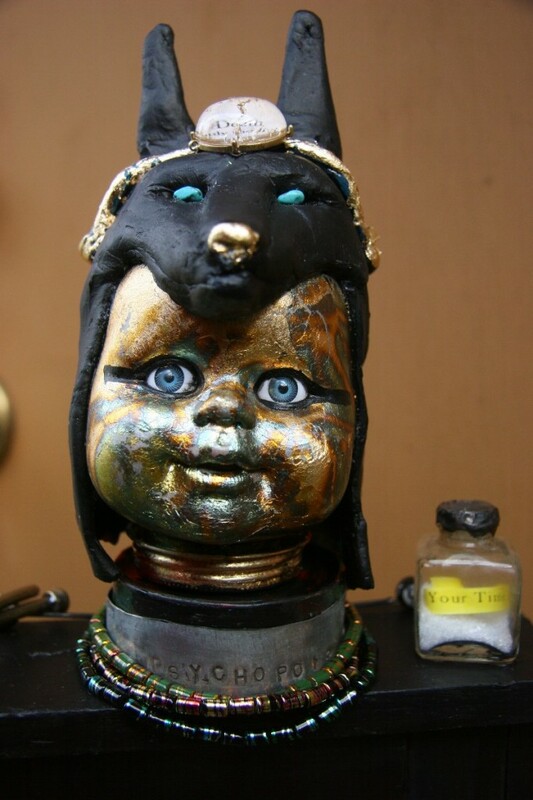 Doll heads are somewhat creepy when re-employed as sculptural artifacts but I love what they do. The face is gold leafed and varnished and the headpiece was sculpted with Apoxy sculpt and painted, the eyes are turquoise chips. I am so happy to have finished the Lost Childhood of Anubis, subtitled Death, the Grim Reaper, etc. I am loving the result. This one was interesting and difficult to approach because the topic of death makes me squeamish. Don’t get me wrong, I’m not afraid of death, I just have too much living to do to want to get to know it up close and personal. It’s sort of a verboten subject in our culture because its a door that opens one way and the unknowable is always a bit scary in my mind. That being said, as a cultural icon, the Grim Reaper is a big one and his childhood? Where to start…every human culture has a death deity that can be a conductor to the other side or the ruler of the other side. My new favorite word is “Psychopomp”, that’s the actual word for the deity that conducts a sould to the next world. I had to incorporate it into the piece. If you get bored with all the pictures before the end I understand completely, I wanted to document the cabinet thoroughly so its here in detail, maybe too much detail, but I hope it provokes a thought or two and a reaction or three along the way. The black humor is evident in the copper words, “At Death’s Door”. 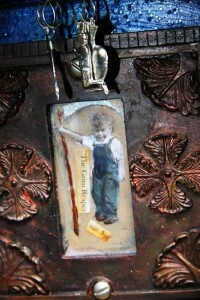 The cabinet feet are children’s blocks that say Lost in front and Love in back. 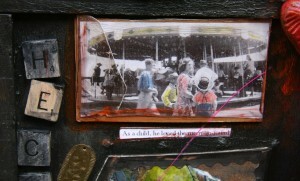 I drilled a vintage die for the knob, playing on the idea of gambling with death found in so many stories. 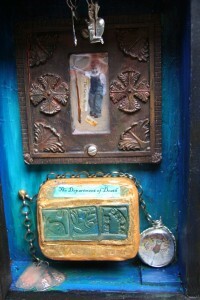 The front is finished off with repurposed scarabs and a faux lapis grave goddess impressed from a Thai grave offering. I love these arms, faience blue holding skulls up in homage, delightfully creepy no? 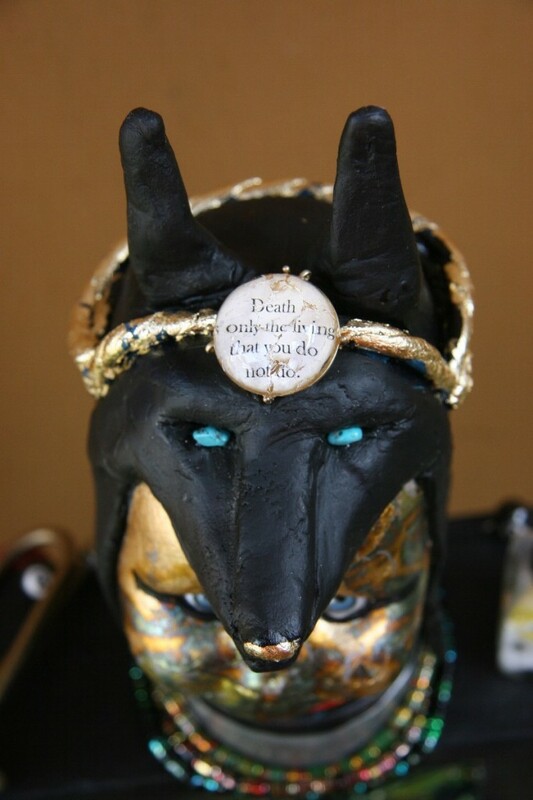 I used a lot of faience blue and lapis colors because of their ancient Egyptian significance–Anubis being my touchstone. The arms I swiped from an Ariel doll with great hands, I gave the “hands of time” two howlite dia de los muertos skulls with vintage lucite flowers planted in them. 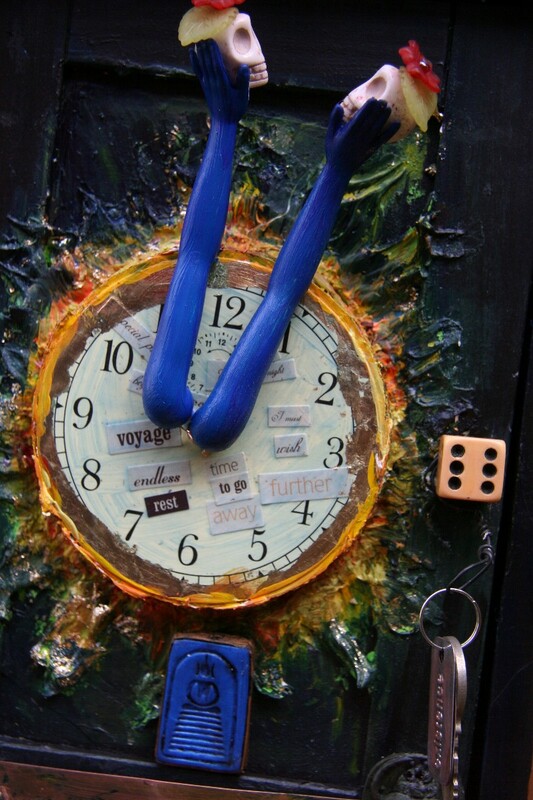 The clock face has random words we use to indicate the transition, the journey, from life to death. I love the little key to the door without a lock, it’s beautiful, an old Master key from my key stash that is heavily engraved and for some unknown reason, it has the words Le Duc engraved in it. The aged tags on the keys say “Quit Exisitence”. A great shot of the flowered skulls and the cool neckpiece with Psychopomp hammered into it. The three necklaces will actually come off, they are actually necklaces made for the piece. 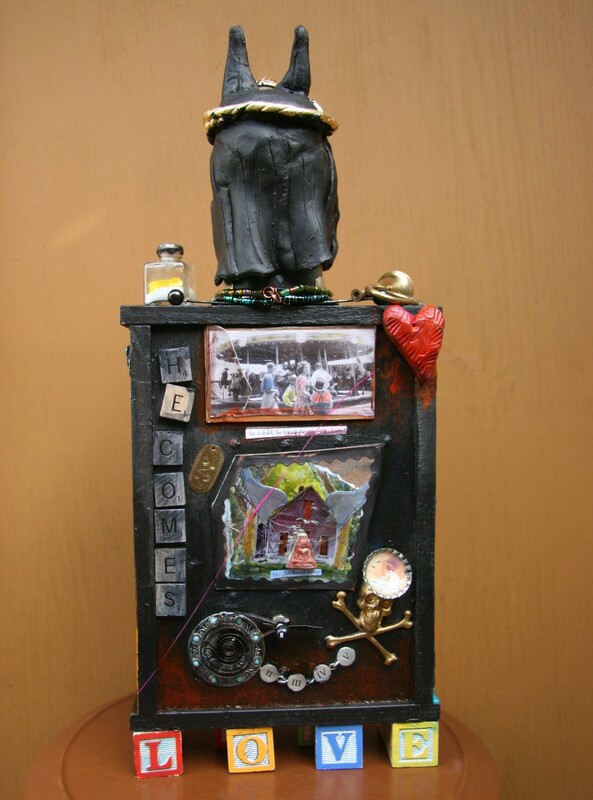 The cabinet is painted in shades of black, brown and blue and is aged with layers of paper, gel and layers of paint. The inside is in primarily blues to signify night. 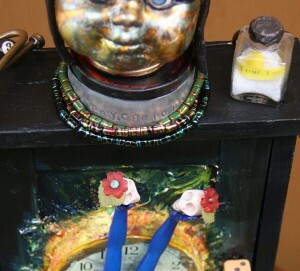 The cabinet interior has a framed childhood photo of the Grim Reaper, the container of the Department of Death, A chain with three tags that say, “Go Little Soul” is connected to a round glass lens. 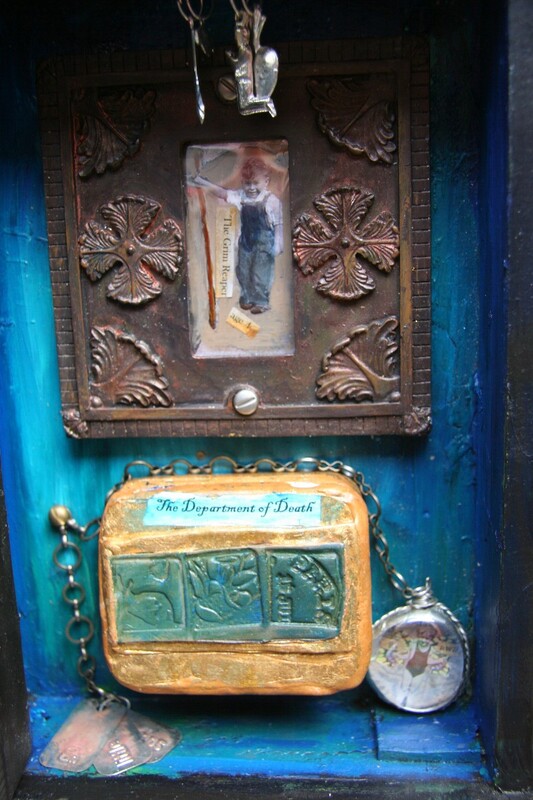 Four silver milagros, Mexican prayers made manifest, hang from the top of the cabinet. Fly Away, glass lens with a picture of a little girl with butterfly wings that say "Fly Away", connected by a chain to words that say, "Go Little Soul". Grim Reaper, Age 4. I love this altered image. I painted a little scythe and mounted it behind a slice of mica in an amazing old light plate cover. I think the most difficult thing about this entire piece was walking the line between sad bathos and black humor. I hate the idea of children and death, and thinking about death having a childhood was an exercise in expanding my consciousness. I found the images I used deeply touching. I couldn’t believe how many cultures were on the list of death gods I uncovered! I put them on a list and put them in the “Deparment of Death”. 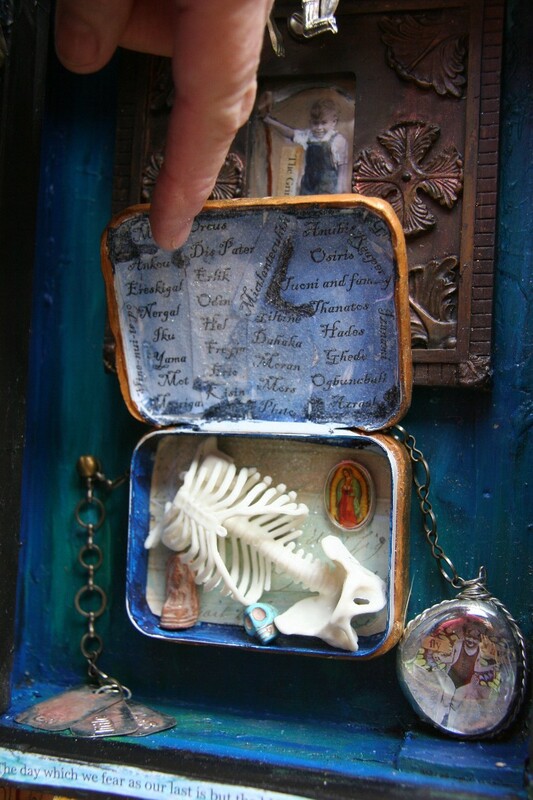 An old tin was repurposed by covering it with mica shifted poly clay and applied stamps. 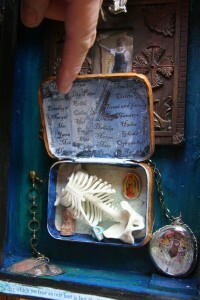 Inside it has part of a skeleton, a howlite tiny skull in turquoise, an icon of a saint and a Thai grave god. On the inside door of the cabinet is a black and white photo of a woman carrying a big gun and looking happy about it. Perfect, Death’s Mother Takes a Vacation. 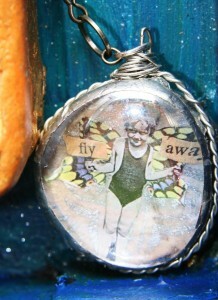 She is mounted behind a slice of mica and wrapped in copper. Above her is an”old bat” and “her little angel”. Obvious? Why not? 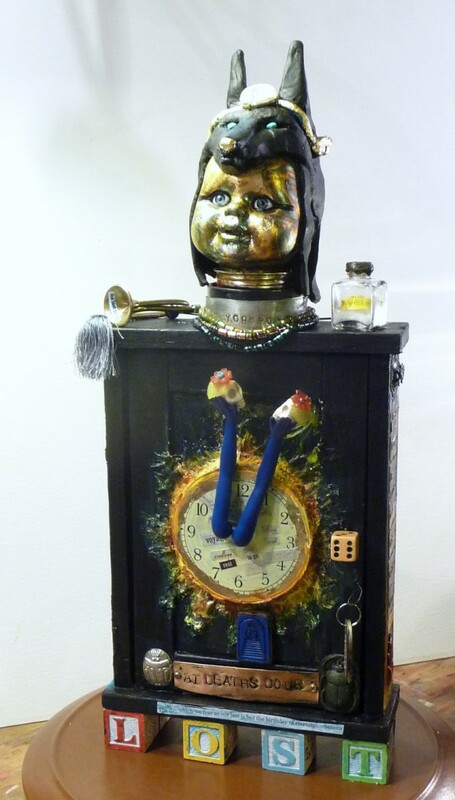 The top of the cabinet has “The Last Trump”–very Victorian, and a glass jar of the sands of time with the words inside, “Your time is up”. 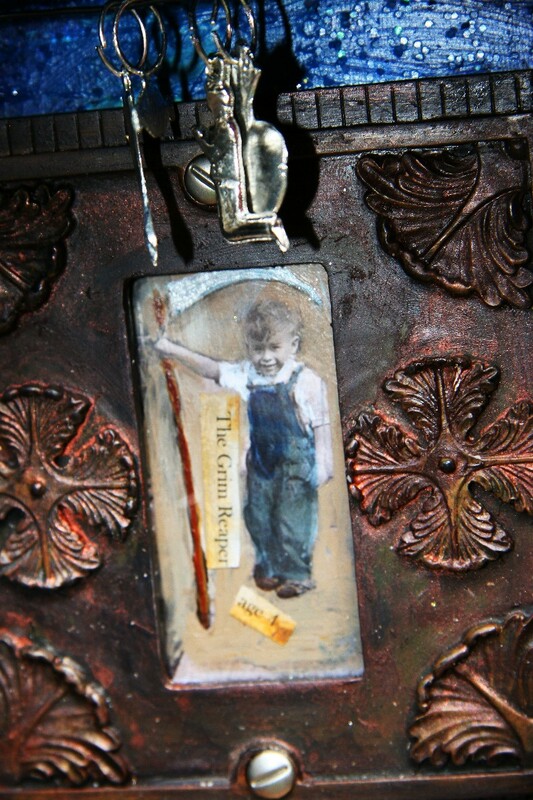 The cabinet back tells more of the story of the Grim Reaper’s Childhood and mementoes. I like the allegory of humans going around in a circle all their lives and the idea that Death loved to ride the Merry go round as a child. 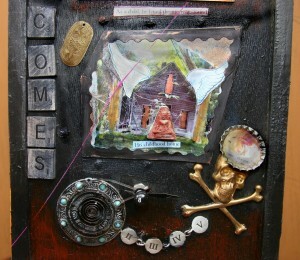 I used old Scrabble tiles for the words “he comes”, another metaphor for the games we play with death. 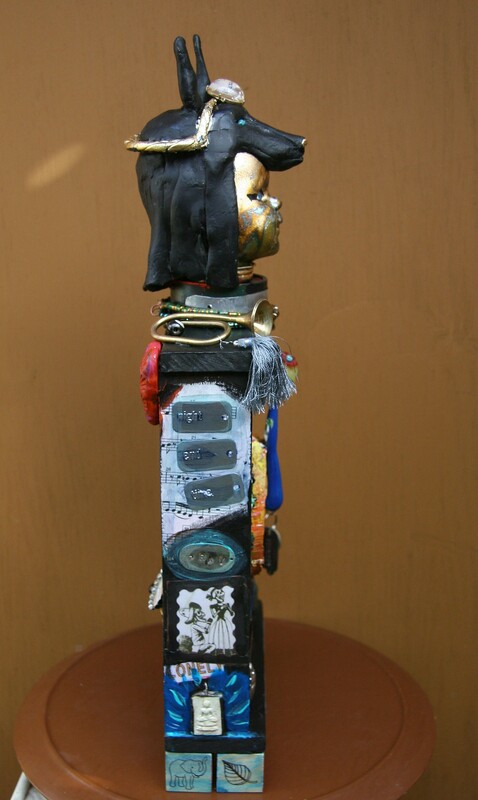 The Egyptian icon has a clock spring mounted on it with a clock hand held in place by an 8 ball. Numbers lead to a skull and crossbones that say “smell the roses”. The picture is actually an old ghostly house I shot in Ophir, Utah and altered. It says “Death’s Childhood Home” and has a Thai grave offering in the doorway. 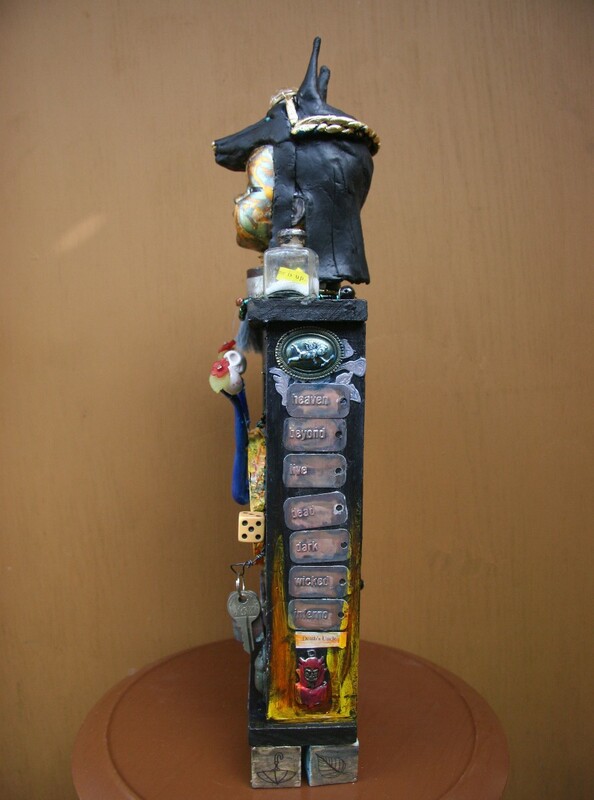 The left side of the piece has a sheet of music from “Hard Day’s Night”, the metal words “Night, End, Time, and Pray”. Underneath them is a piece from a vintage dia de losmuertos postcard wrapped in copper. At the bottom is a grave god from Thailand. Good shot of the last trump too. Anubis full right side view. The right side has aged metal words that go from “heaven to hell”. 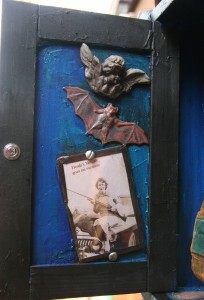 There is a repurposed cupid/angel at the top and a devil with the word’s “Death’s Uncle at the bottom. An essay in 7 words. Clear shot of the “Time’s up” on the shoulder in this picture. I used two of my favorite quotes in this piece, “Death is only the living you do not do”, is from the Laliberte and Pintauro book, “The Peace Box” which I have owned for 40 years and love dearly. The other quote is from Seneca and says, “The day we fear as our last is but the birthday of eternity.” How beautiful is that? This piece gave me a lot to think about and I hope it does that for you. I am already at work on Neptune’s Lost Childhood and putting together the pieces for both Betty Crocker and Demon Rum/Jim Beam/Jack Daniels–again, a multiplicity of iconography in one. I would love to hear your thoughts on this one, it was intense and weird and wonderful. 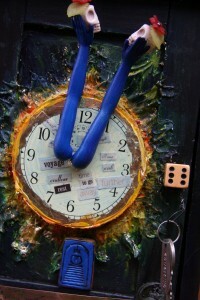 This entry was posted in Art is a tart, Rabbit's Makes Art, Uncategorized on April 19, 2011 by rox.